The Cook-a-Palooza Experience: Put It On…Ice-Ice…Baby! Want to save more than a few bucks on your grocery bill? Then think of Vanilla Ices’ one hit wonder “Ice, Ice Baby” and get yourself a stand-up freezer. My wife and I added one to our basement last year and it’s unbelievable how much money we are able to save on groceries. Instead of buying meat in expensive single servings, we now buy it at much cheaper bulk prices. There are so many things you can freeze that would otherwise go to waste. I freeze sauces, nuts, dried fruit, broths, chicken bones (for broths), butter, berries, over ripened bananas, baked breads and muffins…just to name a few. If you are thinking of buying a freezer, stick with the stand-up variety. Chest freezers are literally a pain in the back and everything gets hidden on the bottom. 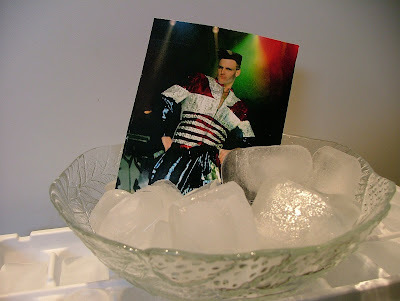 Also, get a self-defrosting one because it makes life as easy as finding ways to poke fun at Vanilla Ice's 80s outfits!